This hardy tree is found in a variety of habitats, in woodland as on campus but most commonly in vine thickets. There is a tree near the car park associated with Rococo’s. It is distinguished by the leaves with 7-9 leaflets, the creamy flowers that are borne in large panicles and the depressed-globose, fleshy, dark, plum-coloured, ribbed fruit (2-4 cm diameter). 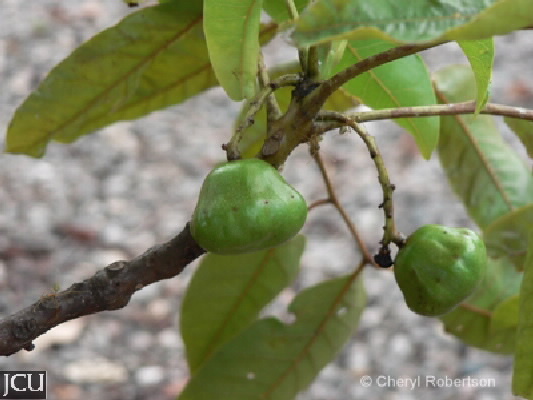 The remains of these fruit are found below the tree, the hard endocarp, that surrounds the seeds, has small openings almost like elongated miniature port-holes. Although the fruit is edible, it is extremely tart unless processed in some manner or is really ripe.